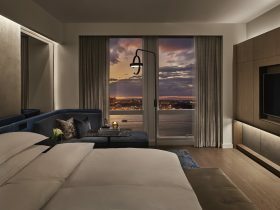 Luxury gym Equinox is now accepting reservations for its Hudson Yards hotel, the company’s first foray into lodging. When it opens in June, the hotel will take up floors 24 through 38 of 35 Hudson Yards, a 1,000-foot-tall tower designed by David Childs and Skidmore, Owings & Merrill for the recently opened neighborhood. The hotel’s 212 rooms are designed to promote better sleep, featuring soundproofed walls, blackout shades, and a thermostat set to 66 degrees. According to the Equinox Hotel website, rooms can be booked starting July 15, with rates starting at more than $700 per night. 35 Hudson Yards. Image courtesy of Related-Oxford. 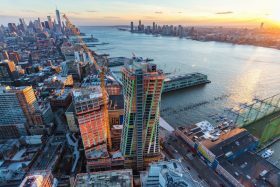 New details and lots of renderings were released this week revealing the 143 residences at 35 Hudson Yards, the tallest residential building in the Hudson Yards mega-development, ahead of a just-announced March 15 sales launch with units starting at $5 million. At over 1,000 feet, the building was designed by David Childs and Skidmore, Owings & Merrill with interiors by Tony Ingrao. In addition to the neighborhood’s loftiest homes, the building is home to the world’s first Equinox Hotel. 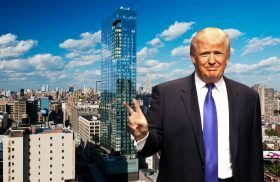 After a prolonged economic slump and a not-so-subtle rebranding, Soho’s Dominick Hotel—formerly known as the Trump Soho—has experienced a formidable increase in revenue, as Bloomberg reports. The revenue per available room rose more than 20 percent from last year. 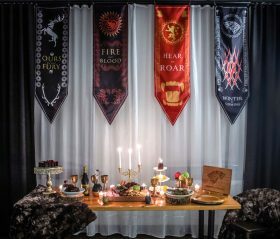 The hotel’s average nightly rate increased by $51 (a 20 percent increase compared to just 2 percent among the hotel’s competitors) and had 7,000 more bookings in 2018 than in 2017. When its retro cocktail bar opens this May, TWA Hotel guests will be able to sip Sixties-style beverages in an expertly designed space. 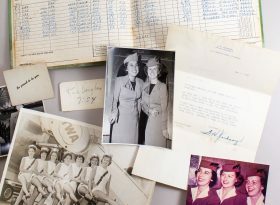 The Sunken Lounge will not only offer classic drinks like Old Fashioneds and Martinis but also views through its floor-to-ceiling windows of the 1958 Lockheed Constellation airplane parked outside. MCR and MORSE Development announced on Wednesday that Gerber Group, of Mr. Purple and The Campbell bar fame, will operate the restored Sunken Lounge, which will officially open on May 15, the same day the first guests will be welcomed to the hotel at John F. Kennedy Airport. 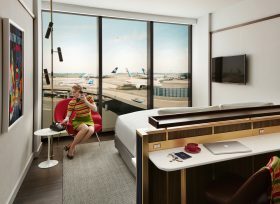 The TWA Hotel at John F. Kennedy Airport is now accepting reservations for its 1960s-themed guestrooms, ahead of its soft opening on May 15. Rooms, decorated with Eero Saarinen-designed Knoll furnishings and martini bars, start at $249 per night. 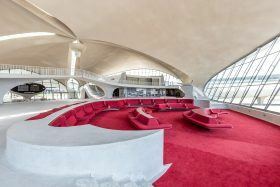 The 512-room hotel sits in two low-rise buildings behind Saarinen’s iconic TWA Flight Center, which has been closed since 2001 and which will serve as the hotel’s lobby. 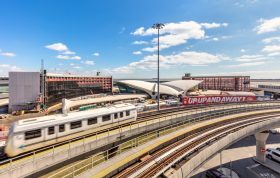 Officially in its final months of construction, the TWA Hotel is nearing touchdown at John F. Kennedy Airport. Led by MCR and Morse Development, the repurposing of Eero Saarinen’s TWA Flight Center into a 512-room hotel and event space is set to wrap up this spring. And while 6sqft has followed the exciting project’s progress since it broke ground in 2016, a time-lapse video recently released by the developers show how the two, six-story hotel wings have taken shape behind Saarinen’s iconic TWA Flight Center over the last two years. 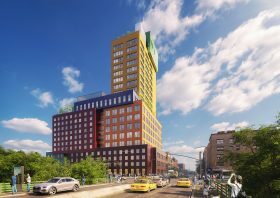 Netherlands-based architecture firm MVRDV on Thursday broke ground on its first major project in the United States: a 22-story tower in Manhattan’s Washington Heights neighborhood. Dubbed the Radio Tower & Hotel, the mixed-use building will feature a hotel, retail, and office space all in a colorful, boxy structure. According to the architects, the vibrant boxes take inspiration from the colors of “storefronts in the majority-Hispanic neighborhood” and keeps them the same size as other buildings in the area.